Aerial view of, 2007, prior to demolition in 2009. 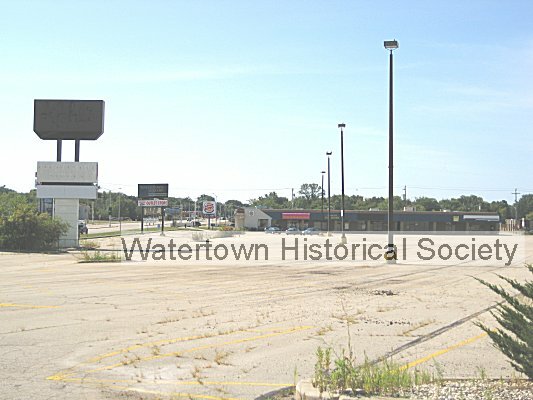 Originally constructed in 1979, the Watertown Square Shopping Center was formerly anchored by a Kohl's Department Store, a Kohl's Food Store and a Walgreens. 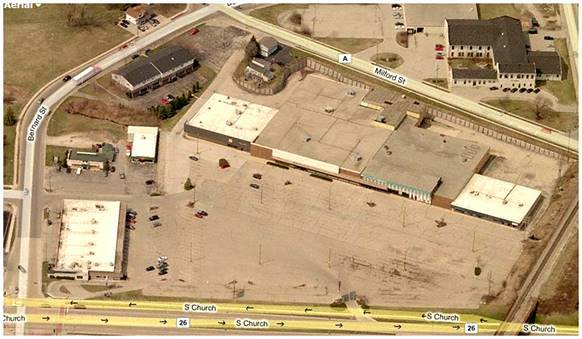 Most of the existing complex has been vacant since April of 2002 when the Kohl's Department Store closed and a new location was constructed just south of Interstate 94 on state Highway 26 in Johnson Creek. The Kohl's Food Store has been closed since March of 2001. 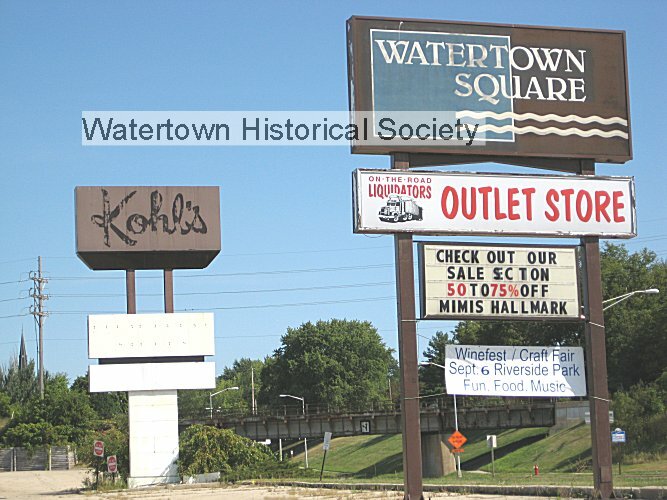 The Watertown Square site slipped dramatically some years ago when Kohl's Food Stores closed and then a couple years later the Kohl's Department Store moved to much larger quarters in the new retail development at the intersection of state Highway 26 and Interstate 94 in Johnson Creek. Without that big retail attraction, some of the smaller businesses immediately felt the loss of the traffic and some closures followed. At one time Church Street was a quiet city street that dead-ended at Milwaukee Street. There was just an open field gradually rising to the railroad tracks. Somewhere in the early 1960s a decision was made to make the extension of Church Street the new location for state Highway 26 and major resculpting of the hill got under way. That opened the land on the south side of the railroad for development. Originally the Kohl's site was the home of a small department store chain called Value Village. That lasted a few years and then the building was razed and everything was started over for the Kohl's food and department stores. Since the present buildings were constructed in the mid-1980s, there had been a host of retailers that have operated in one of the buildings. Among them: Adventureland Video, The Barbers, Boy Blue, Burger King, Como Photo/Video, Groundwater, Joann Fabrics, Kohl's Department Store, Kohl's Food Store, Mimi's Hallmark, Payless Shoes, Professional Cleaners, The Pool Guy, Walgreens, Cost Cutters, Wales Pets, Maxwell Street, Video Towne, Eye Care Optical, Video Town USA, Radio Shack, World of Pets, Nutri-Systems, George Webb, Jefferson Tile Company, Drive-In Movies, Play It Again Sports, Carlson Travel, Oasis Creations, Stein Optical, Watertown Medical Center, On the Road Liquidators and Pay Day USA. And, we've probably missed a few as well. 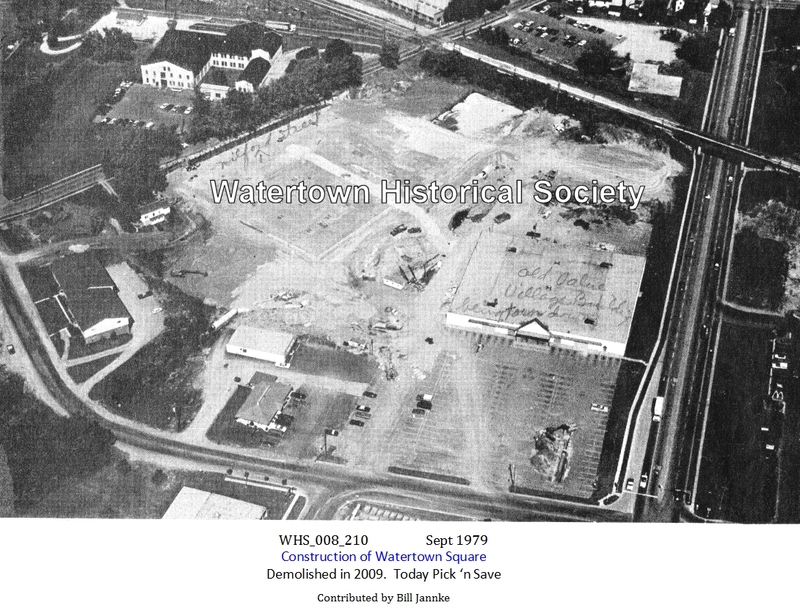 The Watertown Common Council Tuesday delayed taking action on a developer's agreement for the former Watertown Square property because the documents were presented minutes after the meeting started, but city officials gave an update on the proposed development plans for the approximately 10.5-acre site on the corner of South Church and Bernard streets. Pick ‘n Save on the east side of South Church Street will move to a new 60,000-square-foot building at the Watertown Square parcel, which is owned by E J Plesko & Associates in Madison. Plans also include a 500-square-foot building that will house a Bank of Lake Mills. The current structures that were the former locations of Mimi's Hallmark and Walgreens will remain on the property and be refurbished. Completion date and plans to be up and operating are in April of 2010. 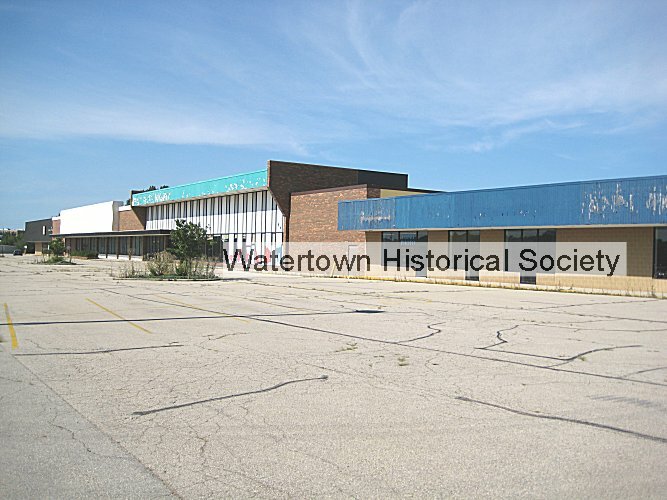 Because the Watertown Square parcel is located within a tax incremental financing district, the city will provide E J Plesko & Associates with approximately $3 million if the property reaches a construction value of $16 million. The property is currently assessed at about $3.5 million.